Amsterdam-based performing artist Elisabeth Esselink has a new amalgamation of garage pop and indie electronica coming out of the Netherlands. The new album, Solex Ahoy! is still inspired by her desire to cobble together found sounds and spontaneous collaborations but has also taken on a new shape. If there is something new about this upbeat and erratic album, it's that the 12-track recording session plays like a road map of regional sound, even though Esselink and Bart van Poppel used waterways to get around. Right on. The pair transversed the twelve provinces of the Netherlands by boat. As they did, they made various random stops during their watery romp, asking various musicians to climb aboard and improvise a tune representative of the surrounding Dutch countryside. What came out of the recording sessions were surprisingly cohesive tracks that pay homage each province despite the often perilous waterways. Solex Ahoy! celebrates the spontaneity of sound. At each and every stop, Esselink wrote down something in her diary about the trip and the music that came tumbling out of it. On one of the best tracks, Gelderland (a.k.a. Wooden Shoes), she writes down how she met former fish shop owner Henk Landkroon in the predominantly rural and open space province that can be hard on people who work it. "When he had to stop working because of back problems, he focused entirely on the accordion," she wrote. "Henk is a genuine brandied raisin and only performs in full costume. That means in keel and wooden shoes." In Nijmegen, Esselink recorded two guitarists, Jasper Konijnenbelt and Wout Kemkens. The tune is motley and meandering, not unlike the region where it was recorded. To get a glimpse of how diverse the various tracks are, check out what came out of Groningen. Groningen is a track that was originally called Pigeons because it represents the chaotic nature of sailing through the Netherlands. You never know when you might get hung up at a bridge or a lock before reaching your destination. Esselink and van Poppel got stuck near a spooky deserted factory. "Right after we had dropped the anchor, a black car drove by and a plastic bag with two dead pigeons was thrown out of the window," she said. "The bag got torn and one of the pigeons landed in the water and the other one got stuck on the bridge. We were astounded! Who on earth does such a thing." The story Esselink shares on YouTube about this story gets even crazier as the two of them find out that carrier pigeons are often used for drug transportation and competing pigeon fanciers do some horrendous things to the animals. Did it color the recording of Annemarie de Bie, Martijn Versteegh, and Andre Dobbe? Maybe. There is a bit of the caper in crafting. A couple graphs about Elisabeth Esselink and Bart van Poppel. Esslelink originally fronted Sonetic Vet, an indie band formed in 1992. 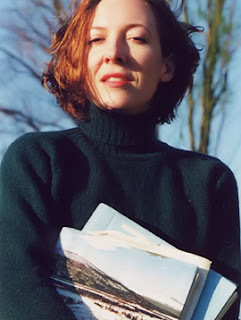 The band broke up in 1997 and rather than look for a new outfit, Esslelink decided to create music out of snippets from albums she could not sell in her Amsterdam record store. Later, she expanded her work by secretly recording dozens of live performances and then cutting them together to make Pick Up in 1999. Although Solex Ahoy! is considered her solo project, she often solicits the help of other musicians. This time it was van Poppel, a musician and indie music professional. Together, they turned their adventure into a chronicle of 12 provinces with 12 songs and 12 stories that are not only captured as an album, but also 12 films, most of them spliced together footage from their trips. My personal favorite is Overijssel, with a hint of Dutch vocals (sort of). Solex Ahoy! Hits 6.8 On The Liquid Hip Richter Scale. Overall, the tracks come close to the feel of improv jazz clubs but with a much heavier indie rock influence. Mostly, they are runaway jams that are carry cohesive coolness. None of the tracks necessarily stand on their own. They work best as an entire odyssey. Hit play and walk away. Solex Ahoy! The Sound Map of the Netherlands is available on Amazon. You can download it from iTunes. You can also keep up with Esslelink on Facebook.